The Boone area is blessed with having hundreds of miles of trout streams within driving distance. 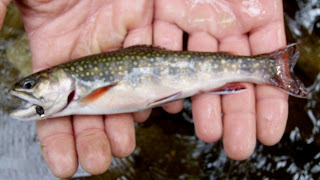 We have plenty of public stocked fisheries right here out the back door, and we have lots of off the beaten path unpressured streams with wild native trout as well. Whether it's just cutting your teeth on a half day on the stocked streams, or blazing a trail miles into the wilderness systems of Pisgah - HCGS can offer a professional experience on the water. These trips are walking and wading excursions based within Watauga and Avery County, on our Delayed Harvest and Hatchery Supported Streams. These trips are walking and wading excursions with an emphasis on a hike-in day trip style expedition in the Wilderness Systems outside of Boone. (Typically within an hour drive) Anglers should be prepared to have wading experience and hiking skills.